And then, oddly, the two-lane diverged into separate one-way streets. Normally, the two-lane pierces the heart of a small town’s business district. From Lewis Ave., Ash Fork didn’t seem to have a commercial district. And snatched glances to the south revealed only a couple of businesses on the opposite one-way, Park Ave.
What brought me to a stop was a water tower. On four steel-latticed legs, it stands outside Lewis’s left-reaching arc that reunites it with its eastbound sister. 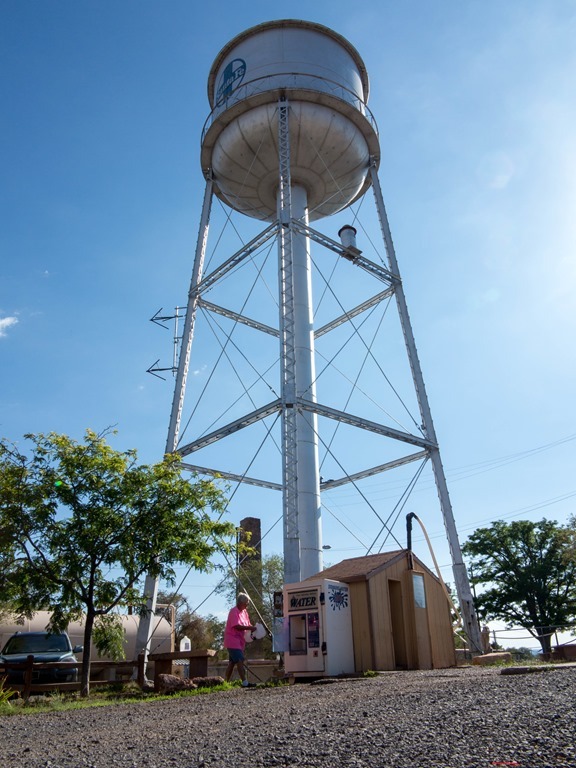 Unlike other water towers that name the small towns they serve, this one bore a blue tattoo on its silver skin, halfway down from its conical cap. Why does it wear the logo of the Santa Fe Railroad? Hoping for an answer, I dismounted next to the Ash Fork Centennial Park. A chain link fence surrounded the triangular gravel bed with several large rocks, two concrete picnic tables, and a single green tree. Just past the fence was a small brown shed that stood between its roadside legs. A standpipe extended above the shed. It anchored a long white, 4-inch thick corrugated plastic trunk. Beside it was an alcove that sheltered the pump’s controls and digital read out. A sign with a ghosted photo background of a water tank emblazoned with ASH FORK 1882 said nothing about Santa Fe, but the words emphasized its message with capitals and colors and creative punctuation. Account Holder of record are the ONLY Authorized users of this facility. Clearly aware of each other, our silent gazes never connected. Her undistractible and efficient feeding of quarters and jugs into the machine, and loading the full container into her car while the next one filled suggested that this was not an unusual errand, or the only one on this day’s to-do list. Or maybe she didn’t want to acknowledge the presence of a hulk in boots and a heavy jacket, working a camera and notebook. Pulling on my Midwestern roots, you filled water jugs in times of emergency, when a main artery broke or something contaminated its supply. Having to fetch water to meet your daily needs, to cook, to drink when thirsty, to brush your teeth, never really dawned on me. 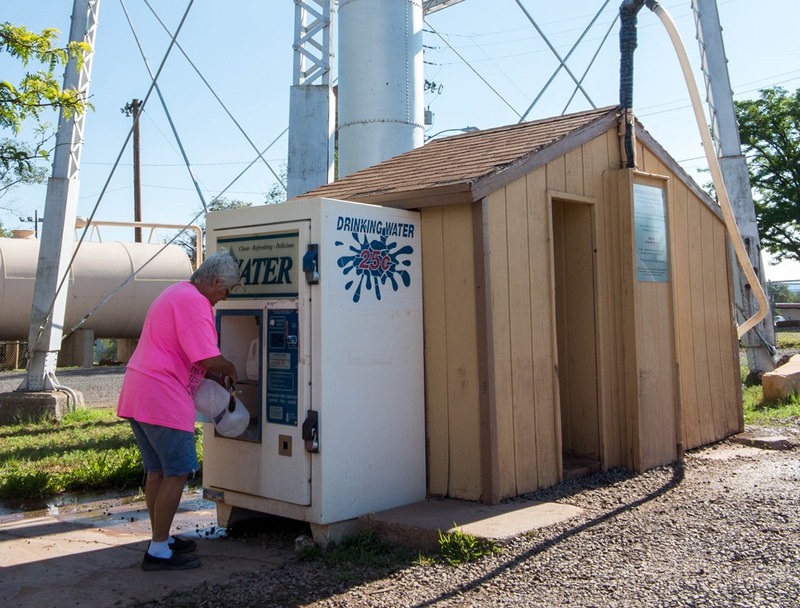 But the tower’s sign and vending machine, and the woman’s clearly practiced effort, suggested that this was part of daily life in arid Arizona. 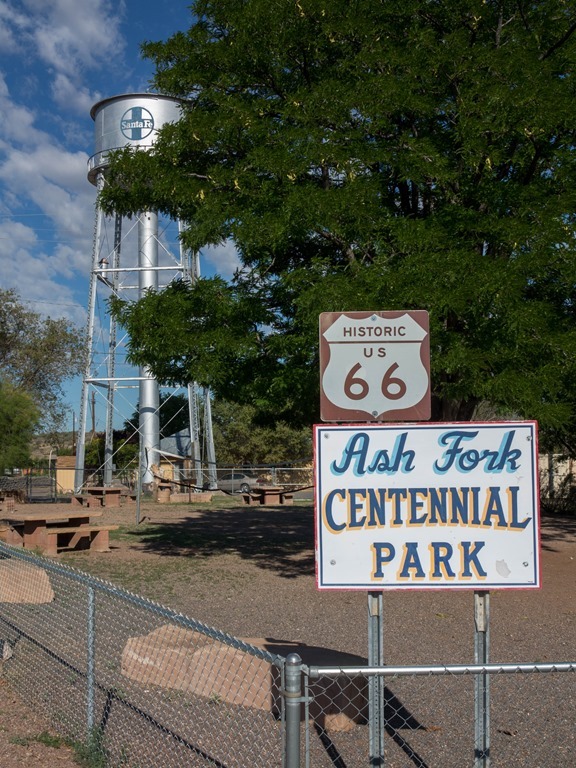 Regardless of its history, Ash Fork was clearly an oasis in a baked land. Later I learned that it had no source of water until the town sunk its first well in 1975, drilling nearly 1,000 feet before they hit water. (It drilled a second well later.) Before that, a daily train delivered drinking water from Del Rio Springs, 33 miles to the south, in Chino Valley. Built as a siding for the Atlantic and Pacific Railroad (predecessor of the Santa Fe), this community of 396 people (as counted in 2010) has burned three times since its founding in 1882. After the first fire in 1893, its citizens rebuilt the town on the other side of the tracks, where it stands today. The next conflagration, known as the Big Fire, destroyed what remained of the businesses district November 1977. The Mother Road herself decimated the community in the 1950s when the road commission bifurcated Route 66 as it crossed the city limit. Construction of the divided single-tracks destroyed downtown storefronts, sidewalks, and residential streets. Then Interstate 40 bypassed the community when it replaced Route 66, diverting the businesses’s life-giving customers. In 1960, the Santa Fe moved its east-west tracks north. As most residents worked for the railroad, Ash Fork’s population fell by half. The flagstone quarries are now the primary employers, followed by the school district. The last major fire claimed a few of the survivors in the two-block business district in October 1987. Ash Fork must have been something before that. With a north-south rail line crossing the Santa Fe’s east-west line, it was a busy railroad junction. Harvey House built the Hotel Escalante there in 1907. Uniting concrete and steel in the Mission Style, its 420-by-200-foot footprint encompassed the hotel, a dining room, a lunch counter, and gift shop. It closed in 1948, and they razed it in the 1970s. 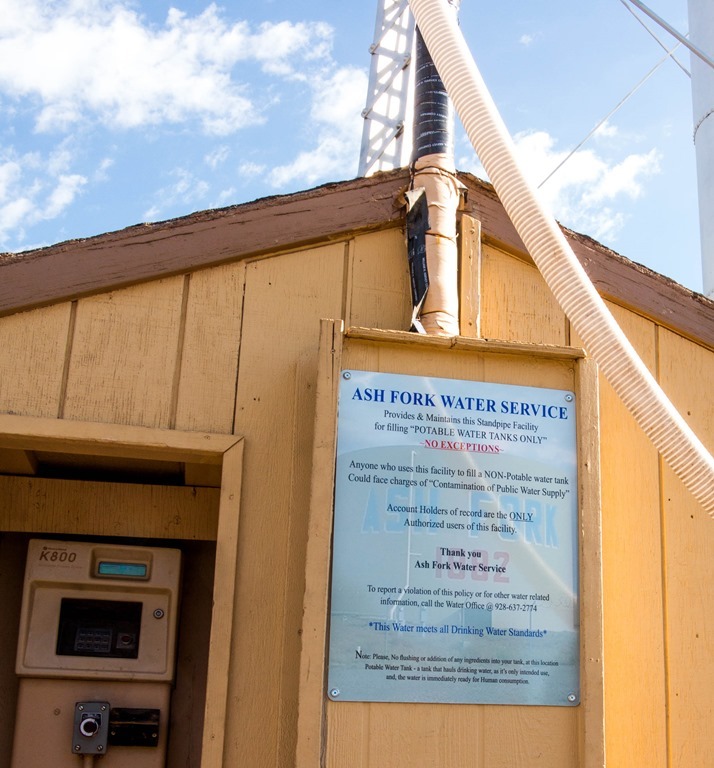 Better than those who reside in greener parts of the ration, those who live in and around Ash Fork know that their future well-being depends on the aquifers that sustain them. According to a 2014 report, Ash Fork Water Manager Lewis Hume wrote that the community depends solely on ground water wells, and it is not abusing its aquifer contained by Tapeats Sandstone and Martin Limestone. The report said the water service dispensed 45 million gallons (MG) in 2007 and 2008. It pumped 35 MG in 2013 and anticipated 37 MG in 2014. That’s a lot a one-gallon jugs. As Ed and I continued west, the woman in the florescent pink t-shirt was filling the last of hers. Freelance writer, editor, and photographer of myriad aviation topics and the exploration of America's small towns. This entry was posted in Community, Main Street, Motorcycle and tagged Main Street, Natural Resources, Route 66, Water. Bookmark the permalink.